At the end of last week we published our October Monthly Investment Compass (MIC, access requires subscription), which is a collection of key charts, data, and intermarket analysis that convey our best investment ideas for US and global stock markets, US market sectors and industry groups, individual stocks, and US interest rates and related assets for the next one to several quarters. It includes an accompanying video in which Chief Market Strategist John Kosar discusses each chart’s implications for upcoming US financial market direction. One of the 40 charts and data series we displayed and discussed in that report was the CBOE Put/Call Ratio, which provides information about the relative trading volumes of equity put options versus call options. The rightmost green highlights in the chart below show that the CBOE Put/Call Ratio has for the past week been hovering at a previous multi-year most bearish extreme, indicating a high ratio of put volume versus call volume. The other green highlights show that, as a contrary indicator, similar extremes have closely coincided with every near term bottom in the S&P 500 this year. This means that, unless the S&P 500 (SPX) recovers from major support near 2768 this week, the US broad market has probably changed it’s previous positive bias and is now in the early stages of a major bearish trend change — and headed significantly lower later on this quarter. 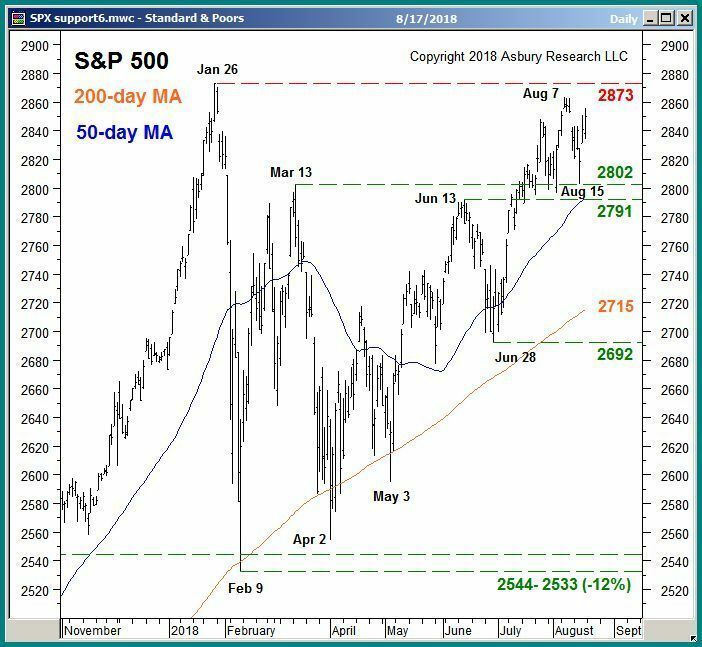 We are sending you this brief market update much sooner than our normal 2-week interval because we thought it might be timely and helpful considering this week’s violent collapse in the benchmark S&P 500 (SPX). It includes a link to a video from Asbury Investment Management (AIM) which explains how we are utilizing Asbury Research investment ideas and strategies to professionally manage client portfolios during these volatile times. Click Here to request further information about our Research and Investment Management Services. 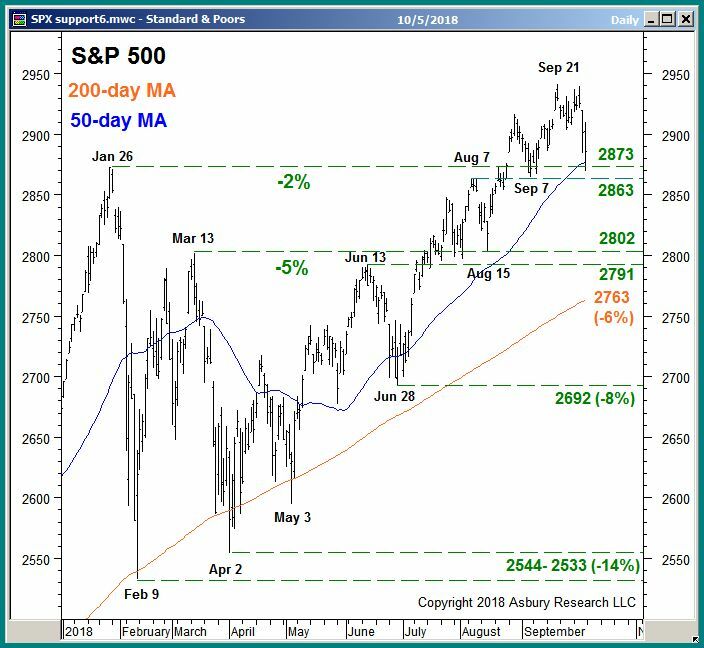 The 2873 to 2863 support area in the S&P 500 was broken early in the trading session on Wednesday, October 10th, and by the end of the session the broad market index had traded as low as 2772 to test the major support area we had identified. Although we believed that a breakdown below SPX 2873-2963 would lead to a test of 2802-2763, I don’t think anyone expected it to happen in one day. We certainly didn’t. SPX 2802-2763 is major support, which means this is where the broad market index’s larger 2016 advance should resume — if still valid. Or, put another way, if the market can’t hold major support, it will slip into a major downtrend, which means an even deeper decline. How can we tell if the major uptrend is still valid? By studying market internals, which let us check the market’s health “under the hood”. For that, we turn to what we call the Asbury 6, which are our six favorite market internals. A chart of one of of the Asbury 6, ETF asset flows, appears below. The pink highlights in the lower panel show that the total net assets invested in the SPDR S&P 500 ETF (SPY) collapsed by $13.9 billion or 4.9% just since October 3rd. This is a big exodus from the SPYder in a very short period of time, and means all of the assets added since September 5th — — during the S&P 500’s most recent advance to new all-time highs — have liquidated, most of them at a loss. Until these assets begin to stabilize and then expand, this week’s sharp market decline is likely to continue. Click Here for our 10/11/2018 Video Review, which explains how we have used our latest research to professionally manage client portfolios. 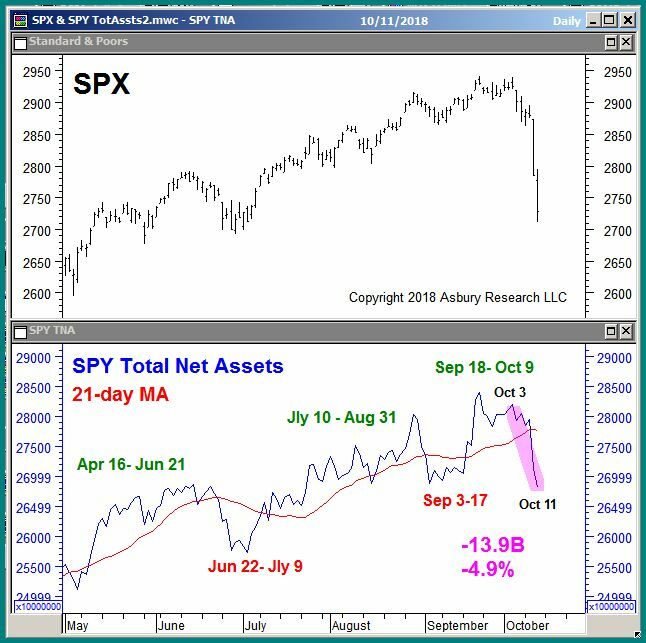 The following is a brief stock market overview from Asbury Research, and below it a link to a video from Asbury Investment Management (AIM) which explains how we are utilizing Asbury Research investment ideas and strategies to professionally manage client portfolios. The benchmark S&P 500 (SPX) collapsed by more than 2.4% last week, high to low, but by the close on Friday lost just 0.97% for the week and is still up 7.9% for the year. The sharp market decline was triggered by an equally sharp move higher in the yield of the 10-Year Treasury Note, above the critical 3.13% area which we have been alerting subscribers to since May — and most recently wrote about in an October 1st article for Forbes. By anticipating the adverse stock market move this sharp rise in interest rates provoked, we were able to avoid much of last week’s decline in investment management clients’ portfolios. The chart below shows that last week’s pullback from the September 21st all-time highs has positioned SPX right on top of minor underlying support at 2873 to 2863. If this support holds, it is likely to become the springboard for a rise to 3000 — our upside target for SPX since May. If broken, however, it would clear the way for a deeper decline to the next key level at 2802 to 2763, which is major support. We will be closely tracking our key market internals over the next several days to anticipate what the market’s next move will be. Click Here for our 10/05/2018 Video Review, which explains how we have used our latest research to professionally manage client portfolios. Part of what our research does to help subscribers be properly positioned in the stock market is to fine-tune their core holdings, taking advantage of relative performance trends in the small, mid, and large cap segments of the market. By modifying the core holdings within a portfolio to take advantage of these internal changes in relative performance, investors can potentially pick up some alpha in a more risk averse way — without changing the size of the core allocation. 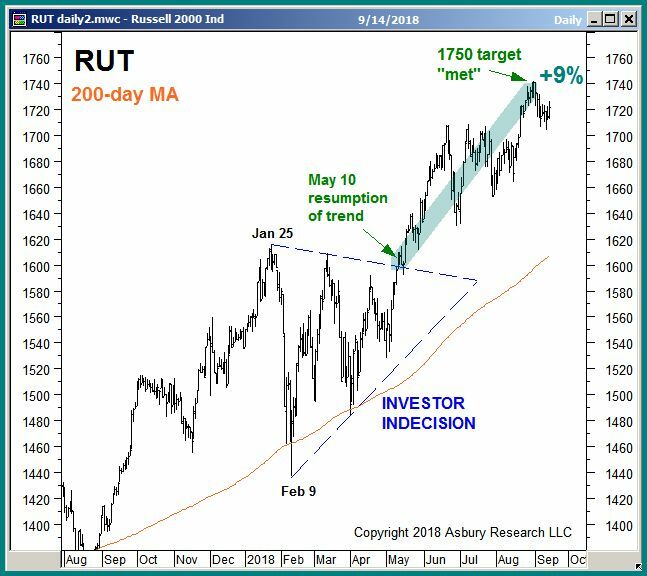 Exactly 4 months ago, in our May 14th Keys To This Week report (access requires subscription) we pointed out an emerging breakout higher in the small cap Russell 2000 and said it targeted a rise to 1750. 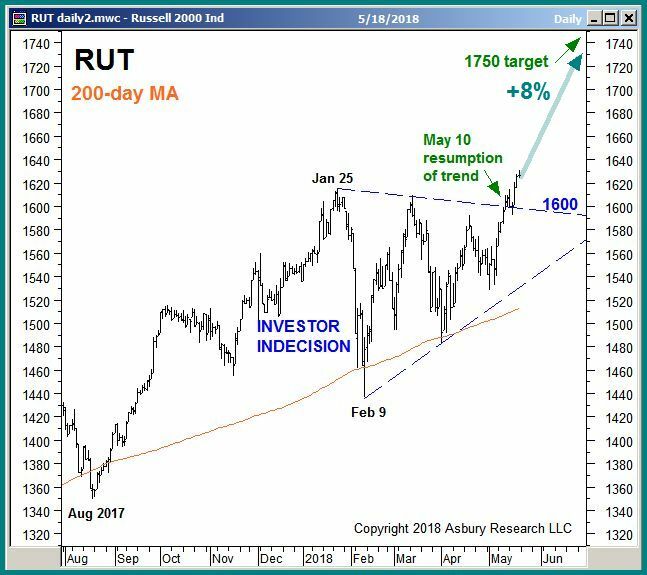 The next chart, an updated version of the one above, shows that RUT traded as high as 1742 on an intraday basis on August 31st, essentially meeting our target, and has since drifted lower. When a stock or an index gets this close to a price target and then stalls or reverses direction, we 1) assume that the directional implications of the breakout have been met and, as a result, 2) expect to see at least a minor decline as profit taking takes place. Accordingly, this chart suggests this may not a particularly good time to to be adding exposure to the small cap space. The next chart is a little more complicated, but simply shows that the Russell 2000 is also currently vulnerable to upcoming relative underperformance versus the overall market, between and year end. It simply shows that the iShares S&P Small Cap 600 Index ETF (IJR,) is retracting from quarterly overbought extremes versus the the iShares S&P 1500 Index Fund ETF (ITOT), and that previous instances of this led every multi-month period of relative underperformance by Small Cap versus the overall market during this period (red vertical highlights). 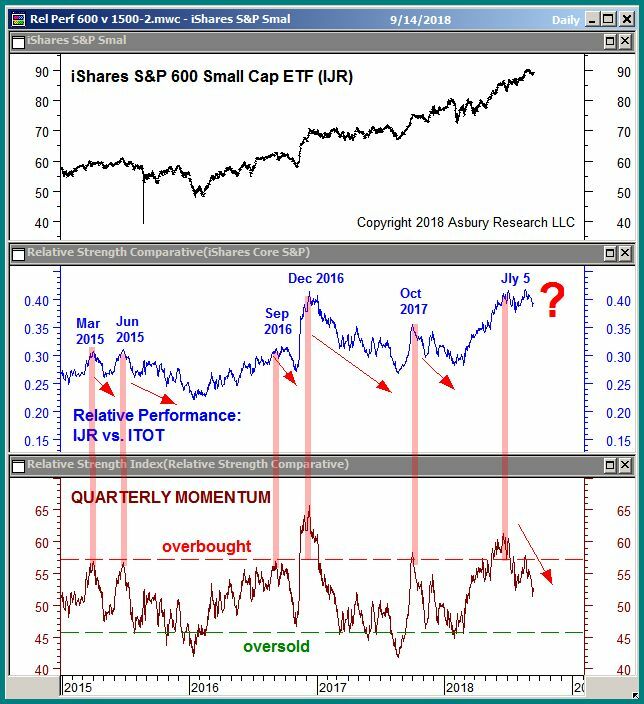 This chart not only suggests that this is not a good time to chase the small cap space on an outright basis, but also that small cap is poised to underperform the overall market during the 4th Quarter. In a case like this, we are looking at similar charts and metrics to determine whether to shade core holdings in portfolios away from small cap, and toward either the mid cap or large cap space, as at least one of these three is always outperforming the overall market. By selecting the right one(s) at the right time, and rotating them throughout the year as necessary, we can add some performance to portfolios without changing the actual size of the investment. The following is a brief stock market overview from Asbury Research, and below it a link to a video from Asbury Investment Management (AIM) which explains how we are utilizing Asbury Research investment ideas and strategies to professionally manage client portfolios. Questions, comments welcome. Click Here to contact us. Perhaps the most important market event since our previous update two weeks ago is the new all-time high in the benchmark S&P 500 (SPX), which exceeded the previous January high of 2873. After setting a new all-time high of 2017 last week, SPX has since backed up to retest the 2873 area today — this time as underlying support. This is where the 2018 advance should resume if it’s still healthy, and the fact that 5 of our “Asbury 6” key market internals (monthly price momentum, relative performance of stocks versus junk bonds, ETF asset flows, market breadth, corporate bond spreads, and volume) are currently in positive territory suggest that it is. Should more broad market strength indeed emerge from the SPX 2873 area, we would expect some new market leadership to come from the semiconductor and biotech space. and a growing list of geopolitical concerns right in front of November mid term elections in the US. So, although our current market bias is positive (bullish), we are a little more cautious than usual right now and will be aggressively protecting capital on any meaningful changes to either 1) the trend in the major US indexes or 2) market internals as mentioned above. Consistent updates on the current condition of the market, including our Asbury 6 market internals, plus access to our Correction Protection Model (CPM) are all available with an Asbury Research subscription. Contact Us for sample reports and pricing. Click Here for our 09/05/2018 Video Review, which explains how we have used our latest research to professionally manage client portfolios. or call 1-844-4-ASBURY (1-844-427 2879). 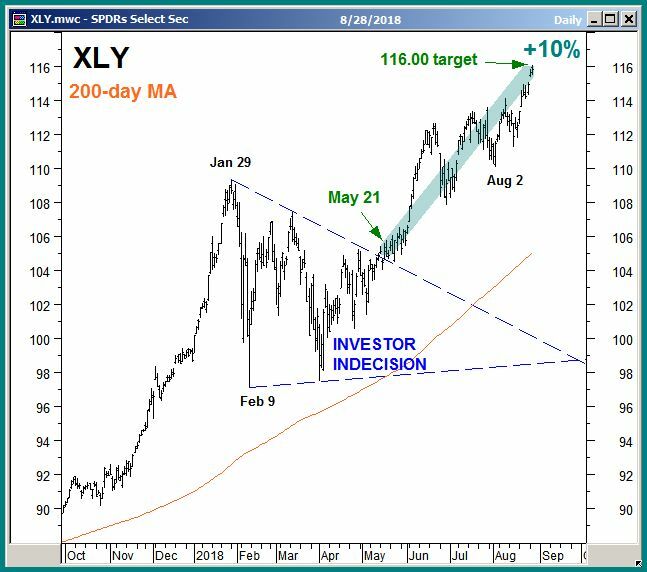 The chart below shows that the SPDR Consumer Discretionary ETF (XLY) met our May 21st 116.00 upside target, as shown in our Keys To This Week report for Market Sectors and Industry Groups, on August 28th to capture a 10.55 point, 10% rise in just over 3 months. XLY also outperformed the S&P 500 (SPX) by 3.5% during the same period. Subscribers and interested investors can view our 2017 closed out trade ideas by Clicking Here. 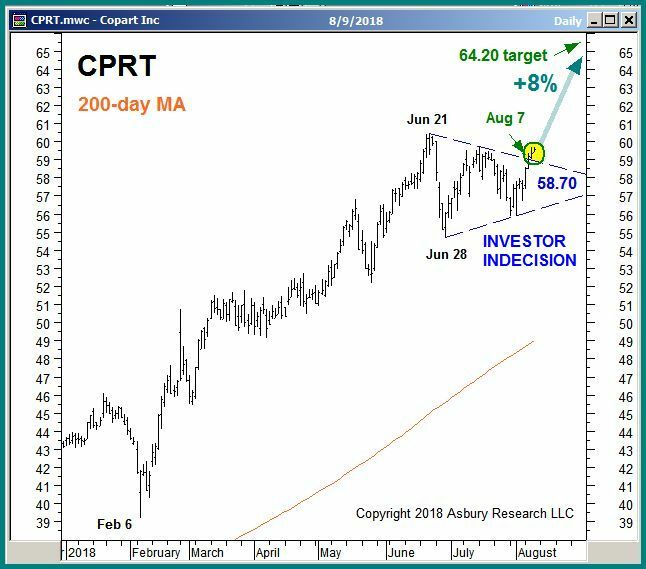 The chart below shows that the Copart Inc. (CPRT) met our $64.20 per share upside target this morning, August 28th, by trading as high as $64.30 intraday. Our price target on this Asbury Momentum idea was first displayed and discussed in our August 9th Asbury Alert (access requires subscription) to capture a $4.69 per share, 8% price advance in less than 3 weeks. 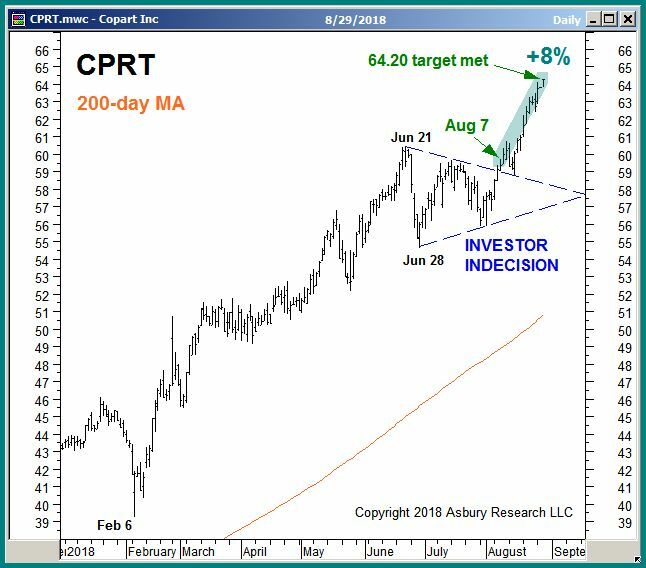 CPRT also outperformed the S&P 500 (SPX) by 5% during the same period. Here is the chart from our August 9th report. Here is this morning’s (August 28th) updated chart. Asbury Research uses two proprietary models in its stocks and ETF selection process: Asbury Momentum and Asbury Value. Asbury Momentum buys strength in strongly trending stocks, and Asbury Value buys weakness within positive price trends. Progressive Corp (PDR) was an Asbury Value pick. 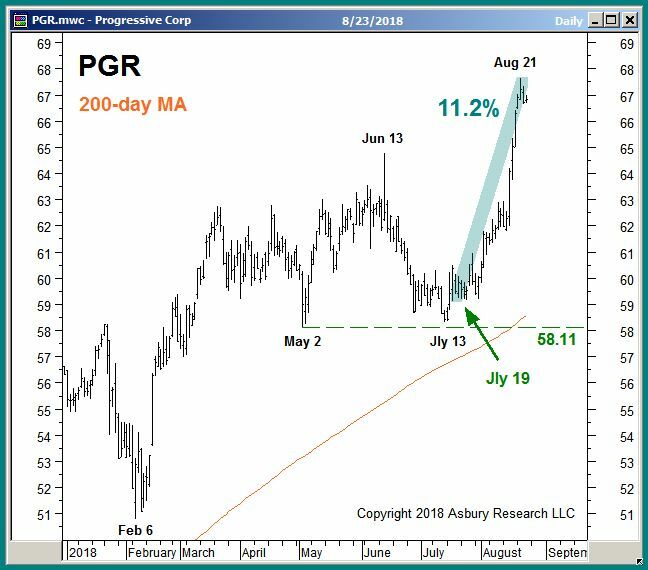 We have exited our July 19th long idea (per our Asbury Value Model) in Progressive Corp (PGR) at 66.64. today per this morning’s update in our Stock and ETF Ideas table (access requires subscription), capturing an 11.2% gain in 27 business days. PGR also outperformed the S&P 500 (SPX) by 10.2% during the same period. Subscribers and interested investors can view our most recent closed out trade ideas by Clicking Here. Both the major and minor trends in the benchmark S&P 500 (SPX) are positive (bullish) as the US broad market index is currently challenging its January all-time high at 2873. Looking “under the hood” of the market, our Correction Protection Model (CPM) remains in a Positive, risk on mode as of July 10th while 5 of our “Asbury 6” key market internal metrics are in positive (bullish) territory. In this type of environment we are adding risk to portfolios by investing in individual stocks and ETFs and, accordingly, have just added 4 new stocks to our buy list within the past week. However, investors also need to be aware of the broader, overall investment environment, and right now there are definitely some headwinds to be aware of. 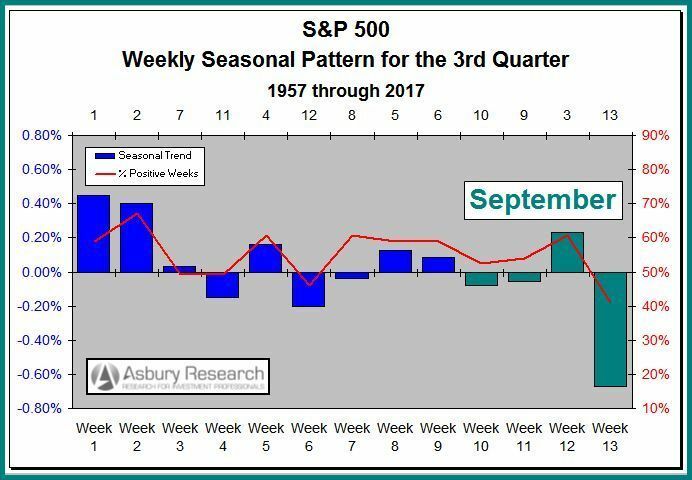 They include negative seasonality in the S&P 500 from now through early October, the fact that 92% of the 52 global indexes we track are in the midst of major downtrends, and, of course, this week’s latest drama out of Washington — the Manafort and Cohen convictions. In situations like this, where the trend is positive but the environment is turbulent, it is imperative to know where the key levels are in the specific assets you invest in, and to have an actionable plan to protect capital should key levels below the market be broken. The chart below shows that minor support in the S&P 500 exists at 2802 to 2791, and that major support is currently at 2715 to 2692. 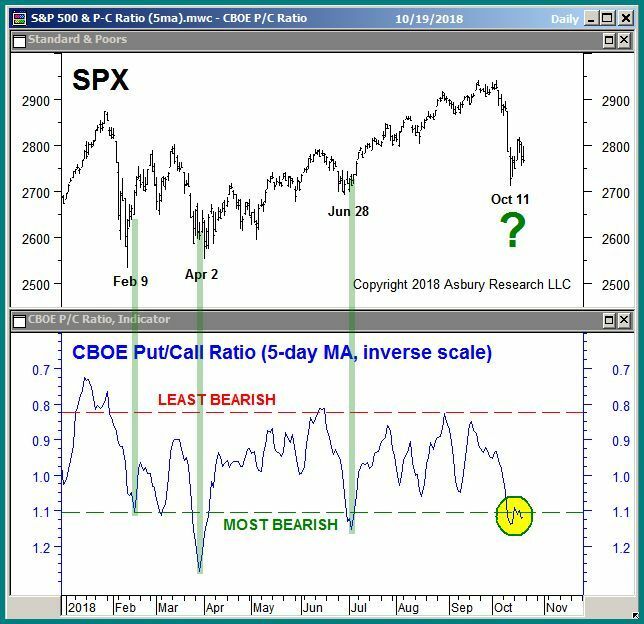 Consistent updates on this developing situation, more charts and detail on current market conditions, plus access to our Correction Protection Model (CPM) are all available with an Asbury Research subscription. Contact Us for sample reports and pricing. Click Here for our 08/22/2018 Video Review, which explains how we used our latest research to professionally manage client portfolios. Marathon Petroleum (MPC): New All-Time Highs? One of the components of our investment research is providing buy and sell ideas in individual stocks and ETFs. We have two quantitative models, Asbury Momentum and Asbury Value, that find and identify these opportunities. A simple way to describe them is that Asbury Momentum buys strength and Asbury Value buys weakness. Asbury Research Subscribers can access all of these by logging into our Research Center. On July 10th we alerted subscribers to a new Asbury Value buying opportunity in Marathon Petroleum Corporation (MPC). Marathon Petroleum Corporation, together with its subsidiaries, engages in refining, marketing, retailing, and transporting petroleum products primarily in the United States. The green highlights on the chart above show that MPC proceeded to rise by 4% by July 25th, the day before Q2 earnings were due to be reported, at which time we suggested that more risk averse subscribers may wish to exit with a small profit rather than take on additional earnings-related event risk. Since then, however, the green highlights also show that MPC has risen by an additional 8% for a total of a 12% gain since our initial July 10th Asbury Value signal. The red highlights show that this post-earnings rally has resulted in a test of overhead resistance at 83.27, which is the April 26th all-time high that had already been re-tested on June 4th and July 31st. The more times an overhead resistance level is tested, the more likely it is to eventually be broken by new highs. 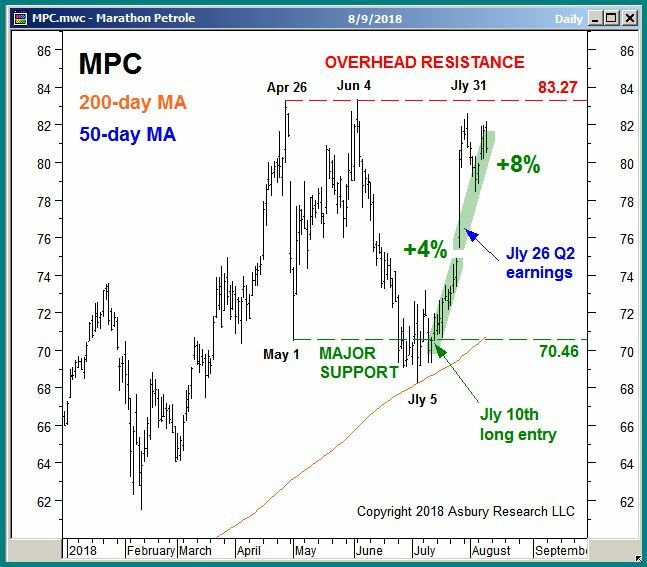 A sustained rise above 83.27 in MPC would clear the way for a much more significant and sustained move higher.